To get the awful taste of that Toronto series out of our mouths, and to prepare for Matt Cain’s start tonight in Colorado, here again is that awesome play turned by Cain last Friday against the Atlanta Braves at AT&T Park. It happened in the top of the second inning with one out and nobody on. With the count 1-2, Braves catcher Brian McCann hit a sharp comebacker that deflected off of Cain’s right thigh and rolled toward the first base line. Without missing a beat, Cain ran for the ball, grabbed it with his right hand just as it reached the line, and flipped a quick off-balance throw to Brandon Belt at first, getting McCann by a couple of steps. Belt was equally terrific on the play, stretching to his left in foul territory to glove the throw from Cain while keeping his foot on the bag. It was only after the play was over that Cain showed how much the combacker stung. Now that’s a major league player. Cain pitched beautifully that game, going eight innings and giving up only two earned runs on three hits. The Giants won, 8-2. We need another one like that. One of the most memorable Braves-Giants games took place September 14, 1986, at Candlestick Park. Bob Brenly, who would later manage the Arizona Diamondbacks during their dramatic 2001 World Series victory over the New York Yankees, was the Giants’ regular starting catcher. However, during this particular game, Brenly was asked to take over third base duties after regular Giants third baseman Chris Brown complained of shoulder soreness. The game was scoreless until the fourth inning. That was when Brenly, not used to playing third, managed to make four errors in the same inning, tying a Major League record. The errors led to four costly runs, putting the Braves on top, 4-0. But what’s truly remarkable about this story is what happened next. Brenly led off the bottom of the fifth inning with a solo home run against Braves starter Charlie Puleo (Bob Melvin, who was catching in Brenly’s place, came up next and hit another solo homer). In the seventh inning, with bases loaded and two outs and the Braves leading 6-4, Brenly singled to knock in two more runs, tying the game, 6-6. Finally, in the bottom of the ninth, with two outs and the game still tied 6-6, Brenly came to the plate and hit a walk-off home run against Braves reliever Paul Assenmacher, giving the Giants a 7-6 victory. “I went from the outhouse to the penthouse,” Brenly joked after the game. Above is a video showing highlights of the game. Today, the site in upper Manhattan where the Polo Grounds used to be is a housing project called–you guessed it–Polo Grounds Towers. Madison Bumgarner is on the bump tonight for the Giants’ first in a three-game series against the Philadelphia Phillies at AT&T Park. The last time Bumgarner pitched against the Phillies was April 17, 2012, also at AT&T Park. Joe Blanton started for the Phillies. The Giants won that game, 4-2, thanks to a strong outing by Bumgarner, some nice situational hitting by the Giants, and three shutout innings from the Giants bullpen. Bumgarner pitched six innings total, giving up two runs on seven hits and one walk and striking out two. The surprise of the night came from Buster Posey. Remember, it was Posey’s first season back after sitting out most of 2011 with a reconstructed left leg. If there was concern about how Posey would perform on his return, this game went a long way in alleviating it. Posey went 3-for-4 at the plate. More encouraging, however, was when he put his leg to the test before 42,000+ by stealing third base in the bottom of the fifth inning. Yep, Buster Posey stole third base. 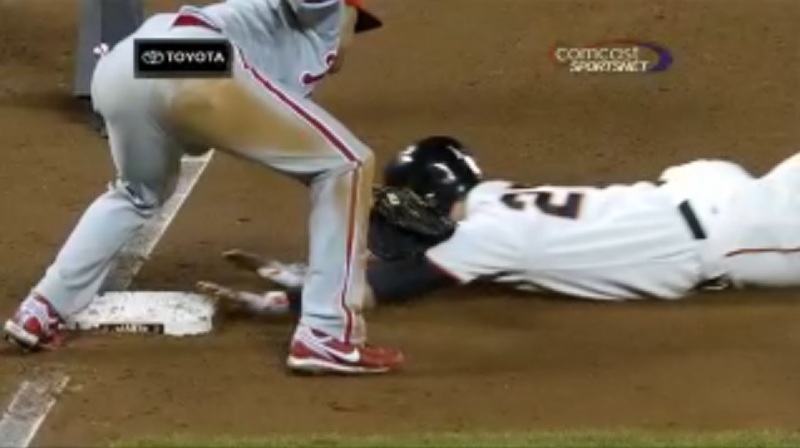 The throw from Philly catcher Carlos Ruiz beat the none-too-fast Posey by a country mile, but thanks to a headfirst slide by Posey and a high tag by Philly third baseman Placido Polanco, Posey’s left hand touched the bag before Polanco’s glove brushed Posey’s shoulder. The stolen base would set up the Giants’ final run of the game as Posey scored on a ground ball to Blanton by Brandon Crawford. Even if you’re not Superman, it helps to feel like Superman. Tonight, Cliff Lee toes the rubber for the Phillies. Last Wednesday, Lee went six innings against the Cleveland Indians, giving up five runs on nine hits and two walks and striking out four. The Indians won that game, 6-0. Today is the Say Hey Kid’s 82nd birthday. Happy Birthday, Willie! Seems like as good an excuse as any to watch him knock a few out of the park. Note: the above video has no audio. The talk of last night’s 2-1 Giants win over the Dodgers was, of course, Buster Posey’s bottom of the ninth inning walk-off home run, a line drive hammered into the left field stands. Believe it or not, it was Posey’s first MLB career walk-off hit. Not just his first walk-off home run, but his first walk-off hit, period. It was a thrilling, satisfying end (if you were a Giants fan) to a tense, strange game that saw Giants pitchers put the lead runner on base seven of the nine innings and Dodgers hitters unable to bring them home. The Dodgers had 11 hits in the game, but scored only one run. The only Dodger to cross home plate last night was pitcher Clayton Kershaw, which was also the case during Kershaw’s first outing against the Giants this season at Dodgers Stadium, a game the Dodgers won. Yet for all the excitement of Posey’s home run, the most compelling moment last night, as far as I’m concerned, was Sergio Romo’s ninth inning, nine pitch battle against Matt Kemp. Kemp ultimately prevailed with a line drive single to right field. Still, the match-up was a thing of baseball beauty. Put away your pitchforks. I’m no turncoat. But the Romo-Kemp struggle was what major league baseball is all about, with two talented players facing off in a war of wills: Romo, painting both sides of the plate with fastballs and sliders against the powerful Dodger right hander; Kemp, fighting off close, tricky pitches with foul balls, fouling one particularly meaty pitch, offering at another way out of the strike zone, spitting at still others, and seeing at least one–the first pitch of the at bat, a fastball inside–get called a strike. That first pitch strike came at an interesting time. Dodgers second baseman Nick Punto, who led off the inning, had just got called out looking on a slider from Romo that hit almost the same spot on the right side of the plate (viewed from the pitcher’s mound). The left-handed Punto thought it was outside, and argued furiously with home plate umpire Joe West. With a dismissive wave of the finger, West silently warned Punto to head back to the Dodgers dugout. Reviewing the replay, it’s clear the pitch was outside. The first pitch to Kemp hit nearly the same spot, yet this one caught part of the plate. Kemp appeared to disagree. Unlike Punto, however, he kept his thoughts to himself, choosing instead to stare in disbelief into the stands along the first base line (was he staring at the scoreboard there to confirm the pitch got registered as a strike?). After all, it was the first pitch of the at bat, not the last. Still, Dodgers hitters must have been confused at the end of a game in which Joe West, throughout most of it, had stuck to an unbelievably tight strike zone. All of a sudden, in the ninth inning, that zone expanded. Which is perhaps part of what set up the battle between Romo and Kemp. Something interesting happened after that first strike. Kemp stepped back into the batter’s box, took a practice swing, then signaled time out to West before stepping back out. Was he trying to get the bad taste of that first called strike out of his mouth? Or was he attempting to throw off Romo’s timing? Perhaps a bit of both. Both times, Romo went into the stretch, only to have to start over and set up again. 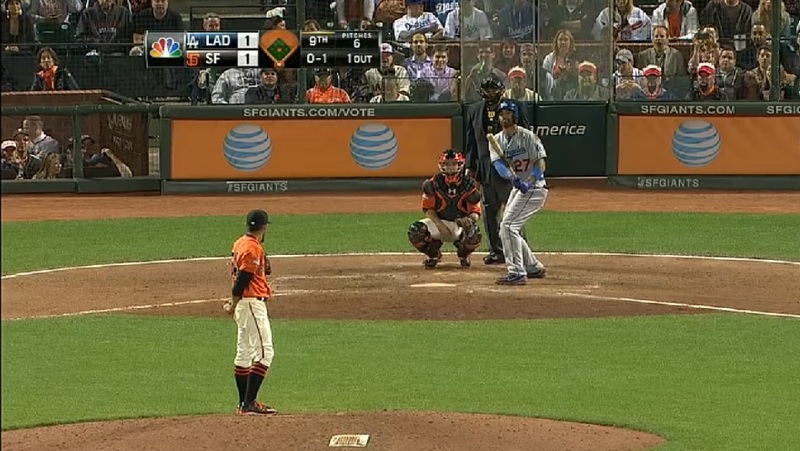 Before Kemp stepped back into the box a third time, Romo went into his stretch, as if he were going to quick-pitch Kemp. West was having none of it. He stepped out from behind home plate to warn Romo. Romo threw out his arms, as if to say, “What did I do?” Giants fans started screaming at West. On the next pitch, Romo threw Kemp a slider that curled and fell away from the plate outside. Kemp swung and missed it by a mile. The count was 0-2. Kemp bounced the next pitch foul off to his left. Then Romo threw a cutter outside that Kemp spit on. The count was 1-2. Kemp fouled another pitch into the stands off first base. Romo was lucky this time. He had hung a fastball over the heart of the plate. Kemp next took a low slider inside that was called a ball. The count was 2-2. Romo went back inside with a front door slider but missed. Barely. The count was 3-2. Seven pitches had been thrown in the at bat. Kemp fouled off the next pitch, a fastball in on his hands. The ninth and final pitch of the at bat was a fastball on the outside edge of the plate. Kemp reached out and punched a line drive into right field. But Romo would go on to win the war. After falling behind Dodgers shortstop Justin Sellers, 2-1, Romo got Sellers to foul off the next pitch. He then struck Sellers out swinging with a wicked slider that broke off the plate out of the reach of Sellers’ bat. A.J. Ellis came up next and popped up the third pitch slider to Joaquin Arias at short for the third out. Posey would lead off the ninth inning. But you already know how this story ends. Did you know footage exists of the Marichal-Roseboro brawl? I didn’t. See the above clip. The video freezes in a couple of places, so be patient. For those not familiar with this famous brawl: It took place August 22, 1965, at Candlestick Park. There had been some heated words between Dodger catcher John Roseboro and several Giants players during the previous game. Juan Marichal was pitching the next afternoon for the Giants, and he threw a couple of brush back pitches that forced Dodger hitters Maury Wills and Ron Fairly to hit the deck. Sandy Koufax refused to intentionally hit any Giants batters in retaliation, so when Marichal came to the plate, Roseboro dropped a pitch behind him, picked it up, and threw the ball back to Koufax, brushing Marichal’s ear. This led to a heated argument between Marichal and Roseboro. To the shock of everyone in the stadium, Marichal suddenly hit Roseboro on the head with his bat several times, opening a gash in Roseboro’s head that would require 14 stitches. The Dodgers and Giants dugouts emptied onto the field. Koufax attempted to intervene. In the video footage, you can see the home plate umpire finally get a hold of Marichal and pull him onto the ground. The Giant with jersey number 26 who is also brandishing a bat is shortstop Tito Fuentes. Thankfully, Fuentes didn’t end up using the bat. Toward the end of the footage, Roseboro charges Marichal but is stopped by Dodgers players. Unfortunately, the throw back from Roseboro that clipped Marichal’s ear has been edited out of the footage. Roseboro sued Marichal over the incident. The case was settled out of court. Many years later, Marichal and Roseboro would patch up their differences and become friends. Who won the game? The Giants, 4-3. However, the Dodgers would get their revenge. They won the pennant that year.